Award winning and celebrated Scottish sculptor Andy Scott has announced that he will hold his first major gallery show in New York this coming June at the Glasgow Caledonian University Campus. Scott, who studied at Glasgow School of Art, creates his monumental metal sculptures in his Glasgow workshop. He is most famous for his landmark Kelpies monument at Helix Park in Falkirk. 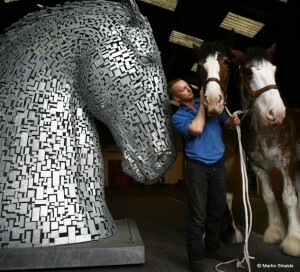 He spent eight years working on the Kelpies, which are a pair of steel horse heads 30 meters high. They are the largest works of art in Scotland and the largest equine sculptures in the world. 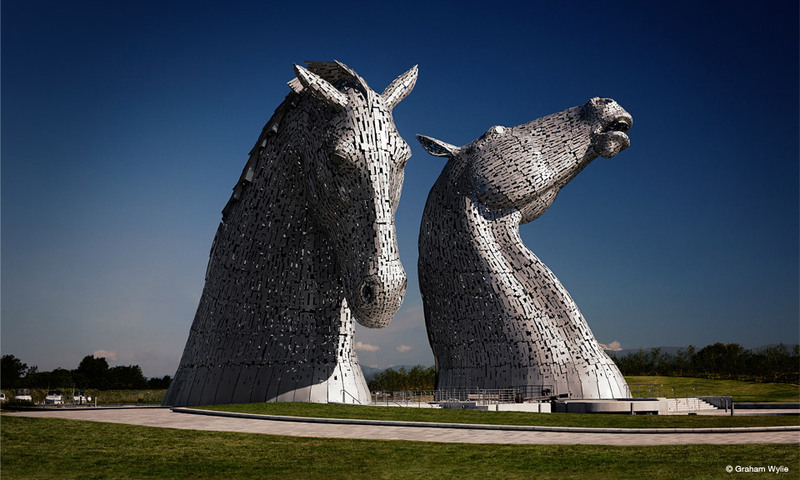 In their first year alone, the Kelpies attracted 1.4 million visitors. In 2014, the ASF worked with Scott to bring the Kelpies to New York. 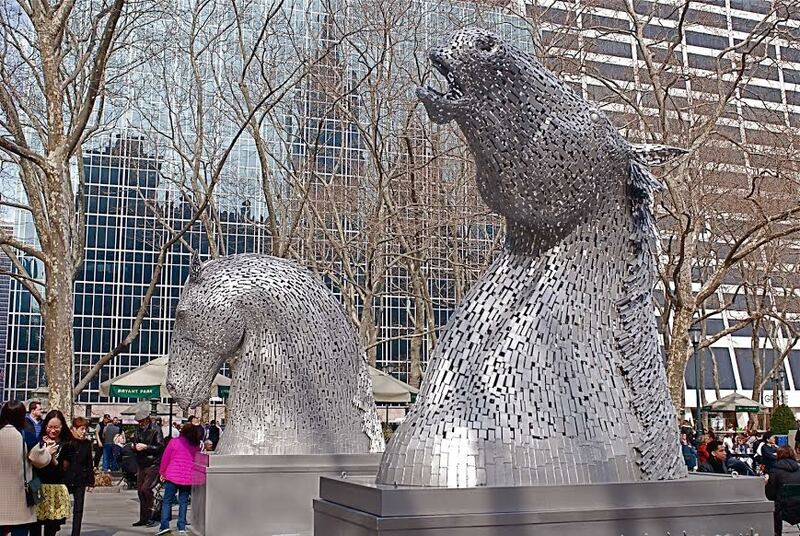 The 20ft Kelpie macquettes were on display during Scotland Week 2014 on the Fountain Terrace of Bryant Park. The Kelpies attracted tens of thousands of visitors to the Plaza bringing a focus to the 100ft Kelpies which were being installed at the Helix Falkirk at that time. Although Scott admits that the vast amount of work threatens to “do his head in,” he is thankful for the chance to share his work with an American audience. “When an opportunity like this comes along you would be foolish not to seize it with both hands,” he said. The American-Scottish Foundation looks forward to attending Andy Scott’s gallery show this June and will share further updates on the upcoming GCU Exhibit as they are announced. Read more about the New York exhibition here. Learn more about Andy Scott by visiting his website, here. This entry was posted in Associate Events, Initiatives, News, Travel in Scotland, Uncategorized and tagged Andy Scott, Bryant Park, Glasgow Caledonian University, Helix Park, Kelpies on December 30, 2015 by Theresa Schilling. ASF is a proud partner of the Archie Foundation, a charity supporting sick children in the North of Scotland. Help show your support today and with a minimum donation of $50, give a ZAINI hat to an ARCHIE child — and receive one for yourself, too! Based in the Royal Aberdeen Children’s Hospital, The ARCHIE Foundation supports the healthcare of over 100,000 sick children every year. With Children’s healthcare being delivered in the Aberdeen Children’s Hospital, Children’s Wards in Inverness and Elgin and numerous community hospitals throughout the Highlands and Islands of Scotland, the ARCHIE Foundation ‘Makes the Difference’ for these children by providing state of the art equipment, highly specialist staff posts, cutting edge research and, of course, lots and lots of toys! Zaini hats, the brand, was launched by Scottish ski instructor Miranda Harper in 2010 as a result of an impossibility to find a comfy, colourful and stylish enough beanie hat. Based in a small village in the highlands of Scotland, people wear beanies all year round and once friends and family saw her hats they all wanted one. So she got back to her crochet hook and put together more colorful designs. 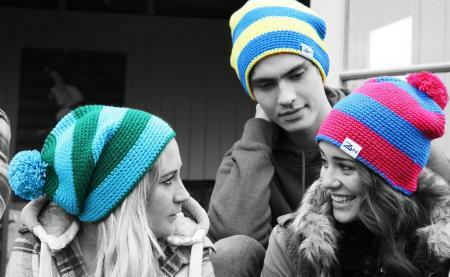 Zaini hats use 100% super soft acrylic yarn, which ensures a non-itch, cashmere feel and is durable in all weather. Pay via our secure facility at Paypal, or make a separate donation to the ARCHIE foundation on our site. Minimum requested donation is $50, but please feel free to be more generous! This entry was posted in Initiatives and tagged ARCHIE foundation, Giving Tuesday, Miranda Harper, Zaini on December 2, 2014 by Camilla Hellman. 2015 is the Year of Food and Drink in Scotland, and from the look of this recently released VisitScotland video, it’s sure to be a mouthwatering twelve months. A Scottish Government initiative led in partnership by EventScotland, VisitScotland and Scotland’s Food and Drink, the Year of Food and Drink will spotlight some of Scotland’s finest cuisine and beverages, as well as the gorgeous locations where they are found. “The Year of Food and Drink is a fantastic opportunity to show off at home and abroad the delicious local produce we have right on our doorstep and to build on the already phenomenal success of our food and drink sector,” commented Food Secretary Richard Lochhead. VisitScotland chairman Mike Cantlay said: “The Year of Food and Drink will see visitors far and wide come and sample our enticing natural larder and Scots enjoying the delicious cuisine that is right on their doorstep. To learn more about the events and featured dishes of the initiative, visit the Year of Food and Drink 2015 homepage. 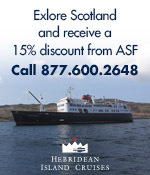 This entry was posted in ASF Events, Initiatives, Travel in Scotland and tagged EventScotland, Scotland's Food and Drink, VisitScotland, Year of Food and Drink Scotland on November 18, 2014 by Camilla Hellman.